[SRGP 07716] - Rev. Nehemiah Hobart Ripley was born in Massachusetts, May 5, 1771, and removed to the vicinity of Albany, New York, whence he came to Tioga County, Pennsylvania, in 1815, and settled in Richmond township, on Corey creek about a mile and a half east of Mansfield. Here, in 1836, he built a saw-mill, where the Elijah Pincheon Clark mill afterwards stood. Mr. Ripley was credited with being the first minister of the gospel to settle in Richmond. township. Before coming to this county he married Lucy Ball, who bore him a family of eleven children. His second wife was Sally Shaw, a daughter of Joshua Shaw. Mr. Ripley was ordained Baptist minister, and preached for that denomination nearly fifteen years, then became a Universalist, and continued to preach the doctrines of that faith until his death, September 16, 1847. [SRGP 07718] - Philip S. Ripley was born near Albany, New York, March 24, 1812, and was a son of Nehemiah Hobart and Lucy Ripley. He came with his parents to Richmond township , Tioga County, in 1815, and there grew to manhood. When he was twenty-one years of age he bought the farm upon which his son, Roswell P., now resides, where he lived until 1892, when he retired from active work and took up his residence in Mansfield. Here he died, April 14, 1895, aged eighty-three years. On December 28, 1837,Mr. Ripley was united in marriage to Lorena Webster, second daughter of Roswell Webster, a native of Connecticut, who settled in Sullivan township, Tioga county, at an early age. Mrs. Ripley was born June 24, 1817, and became the mother of the following children: Hobart, a resident of Glensted, Missouri; Homer J. of Sullivan township; Ezra, a resident of Oneida county, New York; Joel, deceased; Lucy A., deceased wife of Joseph B. Rumsey; Volney, Roswell P. and Charles Creson, all residents of Richmond Township; Philander W. who lives in Scranton and Bertha J. Deceased. Mrs. Ripley died June 3, 1888, and he was again married , to Mrs. Eliza Miller, who survives him. In politics, he was a Republican, and in religion, a staunch Universalist. He was known for his moral rectitude, steadfastness of character and devotion to friends and family. [SRGP 01796] - Capt. Homer J. Ripley was born near Mansfield, Tioga county, December 8, 1839, and lived and worked on his father’s farm until he reached man’s estate. He was educated in the district schools and at Mansfield Seminary. In the summer of 1858-59, he assisted in laying brick in the erection of the Seminary building at Mansfield, and in 1860 did similar work upon the jail in Wellsboro. In the winter of 1861 he entered the store of A. J. & E. R. Webster of Mainesburg, where he clerked until the spring of 1862, and then entered Binghamton Commercial College. In August , 1862 ,he enlisted in the Fourteenth United States Infantry, then a part of the First Brigade, Second Division, Fifth Corps, Army of the Potomac. In September, 1864, he was promoted to Sergeant, and in November was made commissary sergeant. Having passed an examination for promotion before General Casey’s board, he was commissioned second and first lieutenant, successively, in the Fourteenth regiment , in June, 1865. Soon afterwards he was made adjutant, and left New York harbor with his regiment in November, 1865, for California, The command reached Camp Goodwin, Arizona, in May, 1866, and in July the Third Battalion of the Fourteenth became the Thirty-second United States Infantry. He was promoted Captain in the new regiment on September 15, 1867, and commanded at Camp Bowie, Arizona, until July, 1869, when he took a leave of absence for a visit home, and was married November 1, 1869, to Adalena Rumsey, a daughter of Aaron Rumsey, of Sullivan township. In February , 1870, Captain Ripley was assigned to duty as commissary for the Arapahoe and Cheyenne Indians, at camp Supply, Indian Territory, and resigned from the service January 1, 1871. Upon his return to civil life Captain Ripley engaged in merchandising at Mansfield, subsequently located on a farm, but seven years later again embarked in mercantile business at Mainesburg. He closed his store at the latter place in January, 1888, to enter upon his duties as register and recorder, in which office he served three consecutive terms, and then settled on his farm in Sullivan township. He is a member of Mansfield Post, No. 48, G. A. R., and is also connected with the I. O. O. F., and the F. & A. M. societies. Captain Riley is an ardent Republican, and one of the most prominent, popular and active members of his party in Tioga county. [SRGP 01749] - Volney Ripley was born on the old homestead in Richmond township, Tioga county, October 5, 1843, a son of Philip S. and Lorena Ripley. He was reared on the farm, and has made farming his life occupation. In the fall of 1864 he enlisted in Company K, Two Hundred and Tenth Pennsylvania Volunteers, and participated in the battle of White Oak Road. In July, 1865, he removed to Oneida county, New York, purchased a farm and lived there until January 1867, when he traded it for his present place of 100 acres, in the eastern part of Richmond township. On January 9,1866, Mr. Ripley married Ameda Rumsey, a daughter of Aaron and Aurilla Rumsey, and has two children, Maude A. and Adeline May. He is a Republican, in politics and a Baptist, in religion. He has served as school director of his district, and is connected with Mansfield Lodge No. 526, I. O. O. F., also with Mansfield Post No.8, G. A. R. Mr. Ripley is one of the prominent farmers of the township, and is highly respected in the community where most of his life has been spent. [SRGP 35972] Elijah Pincheon Clark was born in Richmond township, Tioga county, Pennsylvania, May 16, 1807, a son of Elijah and Lydia ( Mixter) Clark. His father was born in Wilbraham, Massachusetts, in 1783, married Lydia Mixter in 1803 and came to Tioga county in 1806. He was one of the pioneer settlers of Richmond township. His first wife died in 1833, and in 1835 he married Mrs. Hannah Jackson. He died January 5, 1864, aged eighty- one years. The subject of this sketch grew to manhood in his native township, and followed farming and lumbering. On October 20,1834, he married Fanny Fitzgerald, a native of Orange county ,New York, born December 28, 0803. The following children were born to this union: Daniel E., who died in Whitewater, Wisconsin, July 28, 1863; Warren M., a contractor and builder, of Waverly, New York; Frank W., a lawyer of Mansfield; J. Miller, proprietor of the Corey Creek Stock and Dairy Farm, former superintendent of the State Orphan School at Hartford, Pennsylvania, and now superintendent of the State Industrial School at Scotland, Franklin county, Pennsylvania and Myron S., who died in 1865. Mrs. Clark died April 11, 1873 and in 1879 Mr. Clark married Mrs. Eliza Randall. He died October 27, 1884. [ZRGP 05636] John Kelts, a native of the Mohawk valley, New York, came to Tioga county, about 1804, with his brothers, Peter and Jacob, and settled on the site of Mansfield, being the first permanent settlers at that place. About 1813 he married April Button , who became the mother of the following children: Sobrine, of Richmond township; Jerusha, deceased wife of Seth Rumsey; Mary Ann, widow of Shippen Eastman, of Lawrenceville; Edgar, a resident of Lawrenceville; Jacob, who resides in Westfield; John, deceased ; Finley, who lives at Hornellsville, New York, and Horace, who lives in Knoxville. Mr. Kelts died in Knoxville at the age of eighty-five years. [SRGP 62308] Sobrine Kelts, eldest son of John and Abigail Kelts, was born in Mansfield, Tioga county, December 6, 1814, and is the oldest living person born within the limits of the borough. He was reared on his father’s farm and endured the usual privations of pioneer life. On August 27, 1837, he married Susan Middaugh, a daughter of Joseph Middaugh , who settled in Lawrence township in 1806, on the farm now occupied by Mrs. Elizabeth Knapp. Eight children have been born to this union: Victor Leroy, deceased, who served in Company G, Fifty-first Pennsylvania Volunteers, and died at Camp Parole, Annapolis, Maryland, May 12, 1863; Alexander Hamilton, a member of Company D, same regiment, who was killed at Fredericksburg, December 13, 1862; Isabel, wife of Valentine Reep; Catherine widow of Daniel Clark; Della, wife of Horace Reep; Horace , a resident of Mansfield; Sarah, wife of Sperry Richmond, and Ida , wife of George W. Lenox. In politics, Mr. Kelts is a Republican, and is one of the oldest native born citizens in the county. [SRGP 08279] - Justus B. Clark was born in Wilbraham, Massachusetts, February4, 1800, a son of Seth and Eleanor (Burr) Clark. His father was a soldier under Washington in the Revolution. When Justus B. was six years of age, his parents removed to Vermont, and in 1814, came to Tioga county and settled in the Tioga River valley, below Mansfield. A few years later they removed to a farm on Corey Creek, two miles east of Mansfield. In 1821 Justus B. was married to Catherine Hart, who was born may 25, 1805. The following children were born to this union: John, Julia, who married Albert Sherwood; Lucinda who married Lyman Beach; Justus B., Nancy, who married Middaugh; Daniel and Amanda both deceased, and Morris B. Mrs. Clark died October 7, 1872, and her husband June 24, 1892. He was a typical pioneer and backwoodsman, and in early manhood spent much of the time on a chase, hunting the wild animals that then so thickly infested this region. He was a man of rugged physique and capable of great endurance, and retained his power of mind and memory up to the time of his death, at the remarkable age of ninety-two years. [SRGP 16278] Justus B. Clark, Jr. son of Justin B. and Catherine Clark, was born in Richmond Township, Tioga county , June 5, 1832, was reared on the homestead farm, on Corey creek, and obtained a common school education. On June 5, 1856, he married Susan H. Lucas, a daughter of James and Phoebe Lucas, who bore him two sons, Lyman deceased and George A., now a resident of Mansfield. Mrs. Clark died July 19,1890, and he was married again to Mary N. Johnson, Nee Klock, widow of Henry Johnson, by whom he had one son , Lee Earl. In the fall of 1861 Mr. Clark enlisted in Company B, One Hundred and First Pennsylvania Volunteers, and served until the regiment was discharged, participating in the various battles in which it took part. He entered the service as a private, and by successive promotions, for meritorious conduct, reached the rank of second lieutenant before he was mustered out of service. He was taken prisoner with his company at Plymouth, North Carolina, in April 1864, and was confined in Andersonville and other southern prisons until February, 1865. In 1866 he bought his present farm of 275 acres, in the southeast part of Richmond township. From 1881 to 1885 he was engaged in the general mercantile business in Mansfield with his son, George A. In 1891 he established the Mansfield Carriage Repository, of which his son had charge, retiring to his farm in 1892. Mr. Clark is a stanch Republican, and is also a member of Mansfield Post, G. A. R. and of Sullivan Grange , of Mainesburg. He has served as a school director and has been one of the trustees of the /state Normal School for a number of years. In religion he is an adherent of the Methodist Episcopal church. [SRGP 35983] George A. Clark, son of Justus B. Clark, Jr., and Susan H. (Lucas) Clark, was born in Richmond township, Tioga county, August 4, 1859, was reared on the homestead farm, and received his education at Mansfield State Normal School and Allen’s Business College. From 1881 to 1885 he was a member of the firm of J. B. Clark & Son, general merchants. In 1886 he went to St. Paul, Minnesota, and engaged in the real estate and brokerage business, under the firm name of Abbott & Clark. In 1889, owing to the serious illness of his mother, he sold his western interests, returned to Mansfield, and later took charge of the carriage repository established by his father, purchasing the same in 1895. The business consist of dealing in carriages, wagons, harness, agricultural implements and machinery. On September 30, 1881, Mr. Clark married Fredrika B., daughter of Henry and Jean M. Allen, of Mansfield, who borne him two children,: Frederic Blaine, deceased, and Irme Audrie. In politics, Mr. Clark is a Republican. He is treasurer of Mansfield Lodge, No. 5, S. F. I. [SRGP 31044] Daniel Holden was born in Barre, Massachusetts, September 1,1784. In 1809 he married Lydia Lownsbery, and they became the parents of nine children: Eliza; wife of Martin Stratton, of Blossburg; Lucy, deceased wife of Robert Bailey; Daniel L. born February 10,1814,and died June 17,1892;Isaac, born August 13, 1816, and died March 8, 1893; DeWitt Clinton, born October 14,1818, and died in 1872; John A. born December 20, 1821, now the oldest native-born resident of Mansfield; George R., a resident of Charleston township; Horace W., a druggist of Elmira, New York, and Reuben N., a resident of Reed City, Michigan. A few years after his marriage, Mr. Holden removed to Albany, New York, where he kept a hotel. In 1819 he came to Tioga county and located at Canoe Camp, removing to Mansfield the following year. He settled on the land now owned by P. V. VanNess and D. H. Pitts. In 1826 he built a store opposite his residence, the first one in the village, where he carried on business up to his death, September 4,1830. His widow and son Daniel L. continued the business until 1834. At the time of his death he also owned a store in Sylvania, and was a partner with Thomas K. Mitchell in one at Mitchell’s Creek. He was a man of great energy and enterprise, and occupied a prominent place among the pioneers. His widow died in 1874, aged eighty-three years. [SRGP 62384] Isaac Holden was born in Albany, New York, August 13, 1816, a son of Daniel Holden, and came with his parents to Tioga county in 1819. He grew to manhood in Mansfield, and March 4, 1841, married Lydia Phelps, a native of Chenango county , New York. Her parents came to Tioga county in 1827 and settled at Beecher’s Island, where she grew to maturity. She became the mother of six children, as follows: Delos W. and Ada C. both of whom died in childhood; Charles A., of Mansfield; Addie, wife of George Dorsett, of Jersey Shore; Carrie, and Eva, wife of Leonard Grover, of Buffalo. Mr. Holden was in the grocery business in Mansfield before the war, but subsequently engaged in farming. He died March 8, 1893. Politically, he was a Republican, and in religion, a member of the Methodist Episcopal church. [SRGP 65703] Charles A. Holden, oldest son of Isaac Holden, was born in Mansfield, Tioga county, December 30, 1849.He was educated in the common schools and the State Normal School. After arriving at manhood, he a practical knowledge of business as a clerk in Mansfield and Blossburg. On August 12,1879, he embarked in business for himself in Mansfield, where he opened a fruit and confectionary store, which he has successfully conducted up to the present. Mr. Holden married Catherine A. Dorsett, a daughter of P. R. and Sophronia Dorsett, of Mansfield. [SRGP 63285] John A. Holden was born in Mansfield, Tioga county, Pennsylvania, December 20, 1821, and is a son of Daniel and Lydia ( Lownsbery) Holden. He received such education as the common schools afforded, and in his early manhood learned the carpenter’s trade with his brother-in-law, Martin Stratton, of Blossburg. He worked in the latter place about two years, from 1840 to 1842, and then returned to Mansfield .Up to 1860 he had either built or helped build over one-half of the houses then in Mansfield. In 1861 he went to Fall Brook and worked two years, putting up buildings there. He again returned to Mansfield, which has since been his home. In 1880 he had charge of the work on the public school building of Mansfield. In 1885-1886 he built his present home and the house adjoining, since which time he has lived retired. He is now the oldest resident of Mansfield born within the borough limits. On may 24, 1848, Mr. Holden married Betsy Davis , a daughter of Capt. Ezra and Betsy (Walker) Davis, natives of New Hampshire, and early settlers in Mansfield. Mrs. Holden was born in Londonderry, Vermont, December 14, 1825, and came with her parents to Mansfield in the spring of 1838. To Mr. and Mrs. Holden have been born the following named children: Josephine Adelia, wife of Asa L. Wilcox, of Canoe Camp; Nellie, deceased; Daniel Alfred, a resident of Pittsburg, and Lydia Delphine, wife of Frank Wright, of the same city. In politics, Mr. Holden, was originally a Democrat, then Free Soiler, and has been a Republican since the organization of that party. He was second burgess of Mansfield, has been constable, and has served six terms as assessor, and eighteen years as school director. [SRGP 82528] Lieut. Jacob Allen was born in Massachusetts, in 1763. He served as aide-de-camp to his father at the beginning of the Revolution, and after his father’s death in battle, he continued in the service until the close of the war. He was married in his native state and became the father of seven children. In 1818 he removed to Tioga county and settled on the old Elijah Clark farm, in Richmond township, where he died December 11, 1836. [SRGP 82530] Almon Allen, second son of Jacob Allen, was born in Massachusetts, in 1798. He married Polly Bates, to which union were born seven children, Fordyce, Almon, being the eldest. He came to Mansfield with his family in 1822, from Cummington, Massachusetts, and in 1824 he and his brother-in-law, Solon Richards, erected a woolen factory in the village, which they operated several years and then sold. After living for some years in Ohio, Massachusetts, and Chautauqua county, New York, Mr. Allen returned to Mansfield, where he spent the remaining years of his life. He died in 1871, aged seventy-three years. [SRGP 82537] Prof. Fordyce Almon Allen, eldest son of Almon Allen, and grandson of Lieut. Jacob Allen, was born in Cummington, Massachusetts, July 10, 1820, and was two years old when his parents settled in Mansfield. As a boy he attended the old plank school house near the railroad bridge, on Wellsboro Street. His youth and early manhood were spent in Ohio, Massachusetts and Chautauqua county, New York. While in Massachusetts he learned the clothier’s trade. At nineteen years of age he began life for himself, clerking in Coudersport, Potter county, where he remained until 1844, clerking, attending school and teaching. He next attended the classical school at Alexandria, New York, one year. In 1845 he married Sarah Caldwell, of Coudersport, Pennsylvania, to which union was born one son, Clarence E., now of Elmira. From 1845 to 1848 he taught in public schools of Jamestown, New York. In the latter year his wife died. He next filled the position of principal of the Fredonia High School, Fredonia , New York, for two years and a half, resigning on account of ill health, upon the recovery of which he accepted the principal ship of the academy at Smethport, Pennsylvania. On December 22, 1852, Professor Allen married Jane M., a daughter of Alexander and Eveline Martin, of McKean county, Pennsylvania, to which marriage were born four children, two of whom survive : Fredrick M. and Stella R. In 1853 Professor Allen became editor of the McKean Citizen, and the following year he was elected superintendent of schools of McKean county, the first to hold that office, which he filled until the spring of 1858, when established a normal school at West Chester, Pennsylvania, of which he was principal for six years. In July, 1864, he came to Mansfield and took charge of State Normal School, and was principal of that institution for five years. He established the Soldiers’ Orphan School in the autumn of 1867, the management of which he retained until his death. In the fall of 1877 he again became principal of the State Normal School at Mansfield, being elected for a term of five years, and while still occupying that position, he died at his home in that borough, February 11, 1880. It was as a conductor of teachers’ institutes, however, that Professor Allen achieved his greatest reputation. So successful was he in this department of normal school work that his services were in constant demand in all parts of the country. He devoted one winter to holding institutes in Wisconsin, and in the summer of 1869 and 1870 to the same work in Maine. In the spring of 1871 he held institutes in Vermont, New Orleans, and Mississippi, and in 1876 in Virginia. In 1879 he made a trip to California, and on the way home held institutes in Kansas. In early life Professor Allen was an Abolitionist, and supported James G. Birney for the presidency, and later cast hid fortunes with the Republican party. In religion, he was a member of the Protestant Episcopal Church. His widow, who still occupies the family home in Mansfield, treasures among her most valued possessions the large and well-selected library which her husband collected during his life. Professor Allen was not only a leader in educational work, but was a powerful moral force in the community. He was strongly apposed to the liquor traffic , and bent his energies towards having it so far suppressed as to prohibit its sale within a certain distance of the State Normal School. His untimely death caused general sorrowing, for he was loved and respected by old and young. His ever cheerful smile and encouraging words were an inspiration to all, and few educators could develop the higher qualities in youth to a greater degree than he. So closely identified was Professor Allen with the leading interest of Mansfield, that he is still remembered as one of its most progressive, useful and public- spirited men. As a Christian, friend, husband and father he was above reproach. He lived close to Nature’s great heart, which enabled him to understand the hearts of others and teach the purer, nobler paths of life that alone lead to happiness and contentment. [SRGP 78215] Lorin Butts was born in Windham county , Connecticut, October 28, 1796, there grew to manhood and learned the carpenter’s trade. On May 5, 1819, he married Harried Hyde, a native of the same county, born April 18, 1800. In the fall of 1829 he removed to Lawrenceville, Tioga county, Pennsylvania, where he built the Presbyterian church said to be the first church building erected in the county outside of Wellsboro. In February, 1833, he removed to Richmond township and settled on a farm now within the borough limits of Mansfield, on which stood a small house and a log barn. In the summer of 1854 he built the present resident of his daughter, Bryissa B. Butts, where he died August 16, 1874. His wife died June 17, 1837.She was the mother of six children, as follows: Bryissa B., of Mansfield; Harriet, who died October 4, 1847; Jean M., deceased wife of Henry Allen, deceased; Lucy A., widow of Spencer McIntyre, of Blossburg; Dyer J., of Mansfield, and Lorin Hyde of who resides in New York City. Mr. Butts was an elder in the Presbyterian church and a tireless, enthusiastic worker in both church and Sunday-school. By his personal example and efforts, he did much to forward the cause of religion and morality, and was especially prominent in temperance work. His wife, too, was an earnest and devoted Christian, and was active in the charitable work of the church. During the dark days of the Rebellion, he was ever loyal and devoted to the government and two sons into the army to assist in defending the Union. In Politics, Mr. Butts was a Republican, served five years as a justice of the peace, and also held various other township offices. He was practically the founder of Friendship Lodge, No. 274, F. & A. M., and an active and conscientious Mason. [SRGP 82408] Bryissa B. Butts, oldest child of Lorin butts, was born in Canterbury, Windham county, Connecticut, March 31, 1820. When nine years of age she came with her parents Lawrenceville, Tioga county, and four years later to Mansfield. Her mother died when Bryissa B. was seventeen years of age, and the care of the younger children fell upon her. She has remained unmarried, was the companion of her father during the declining years of his life, and now occupies the old homestead on South Main Street in Mansfield. This and the fifty acres of land adjoining she owns and manages. Though advanced in years, she is still vigorous and active, and gives her personal attention to the management of her property. Her memory of events and incidents connected with the earlier history of the township and borough is clear and accurate. She is known in the community as a very charitable woman, who is always kind and helpful to the poor and needy- a woman whose enterprise , public spirit and charity are well known in the Tioga Valley, where she has lived for almost seventy years. SRGP 00623] Apollos Pitts, son of Hanover and Mollie ( Cudworth) Pitts , was born in Sullivan township, Tioga county, Pennsylvania, May 13, 1810, and spent his early years in that township, with the exception of a few years after his mothers death that he lived with a family named Reynolds, in Hector , New York. His opportunities for obtaining an education were limited to the pioneer schools of that period, and he was reared to habits of industry and economy. On May 10, 1832, he married Phoebe M. Mudge, a daughter of Aaron Mudge, an early settler of Sullivan township, who bore him a family of eight children, four of whom are living: Pembroke P., a resident of Belmont, New York; Mrs. Mary P. Smith, of Osawatomie, Kansas; Daniel H. and John F. The deceased are Charles M., Aaron M., Emma Josephine, who married J.W. Bailey, and Lucinda H., who married J. S. Murdough. In 1837 Mr. Pitts came to Mansfield, and engaged in mercantile business; was also postmaster of that borough, and filled the office of justice of the peace so many years that he was addressed as “Squire Pitts.” He was instrumental in building the Seminary and served as a trustee. He finally settled on a farm east of Mansfield, since known as the Voorhees place, and lived there many years, farming, lumbering, and operating a saw-mill. In 1855 he sold this place and bought a farm four miles southeast of Mansfield. Here he lived until 1865, when he bought the next farm below, now and occupied by his son, John F. Pitts. On this he resided until his death, March 9, 1895. His wife died in December, 1873. A life long Democrat, he was as faithful to the principles of his party during the long years since it lost its ascendency in this county, as when it was the majority party, and never missed an opportunity of recording his convictions at the polls, his last visit to Mansfield being on election day, in November, 1894. [SRGP 04220] Capt. Aaron Mudge Pitts, son of Apollos Pitts, was in Sullivan township, Tioga county, October 27, 1834,and came with his parents to Mansfield in 1837.He was educated at the common schools, the Genesee Wesleyan Seminary, Lima, New York, and Mansfield Classical Seminary. In 1858 he removed to Doniphan county , Kansas, and while residing there served as constable and deputy sheriff. On August 10, 1861, he enlisted as a private in Company A, Seventh Kansas Cavalry, and rose by successive promotions until he was commissioned captain of Company D, in 1862. He served principally in Mississippi and Tennessee, and was highly complimented by the commanding general for discipline and gallantry. In 1865 he was stationed at St. Lewis as a member of the court martial board, and was honorably discharged with the regiment at Fort Leavenworth in September of that year. The following December he returned to Mansfield, and in February, 1866, went into the mercantile business with J. S. Murdough and his brother, D. H. Pitts, the firm being Murdough & Pitts Brothers. In 1869 the firm became Pitts Brothers, and so continued until 1879, when Aaron M. withdrew and embarked in the lumber and real estate business. He later engaged in the sale of agricultural implements and buying grain, which he continued until failing health compelled him to retire. Captain Pitts was married May 1, 1866, to Fannie A. Bixby, A daughter of Amos and Lydia G. (Sheffield) Bixby. She was born in Yonkers, New York, May 4,1839, and came to Mansfield with her parents in 1844. Two children were born of this union: Harriet, wife of Rev. Charles K. Newell, a resident of Big Flats, New York, and Wayne A., a merchant of Mansfield. Through a life-long Democrat, Captain Pitts was proud of having voted for Lincoln in 1864. He was a trustee of the Mansfield State Normal for many years, and was a prominent member of the G. A. R. and the Tioga Valley Grange. He died October 2, 1891. For over a quarter of a century he was one of the leading citizens of Mansfield, noted for his energy, enterprise and public spirit. [SRGP 04217] Daniel H. Pitts, son of Apollos Pitts, was born in Mansfield, Tioga county, May 11, 1839, and was educated in the common schools and Mansfield Classical Seminary. After leaving school he worked on the homestead farm until April, 1861, when he enlisted in Company K, Fifth Pennsylvania Reserve, and served with his regiment until June, 1864. Among other battles, he participated in the Seven Days’ Fight before Richmond and the battles of the Wilderness, where he was wounded in the right arm. After his discharge from the service, he became sutler of the Seventh Kansas Cavalry, and continued as such until the close of the war, when he returned to Mansfield. In February, 1866, he became a member of the firm of Murdough & Pitts Brothers, which three years later changed to Pitts Brothers. In 1879 his brother, Aaron M., withdrew, and Frank Hart acquiring an interest , the firm then became D.H. Pitts and Company. A short time afterwards Mr. Pitts purchased Mr. Hart’s interest, and has since carried on the business alone, his store now being the leading mercantile establishment in Mansfield. January 4, 1870 , he married Jennie Bodine , a daughter of Frederick Bodine, to which union have been born three children: Clyde D., Eva B., and Lew F. In politics, Mr. Pitts is a Democrat, and has served as burgess, member of the council. and school director. As a business man, his career has been one of uninterrupted success, and he justly ranks ad one of the leading citizens of his native county. His store stands upon the spot where he was born, and the large business which he has built up is the most enduring and appropriate monument that it could bear to mark the growth and development of the town. Mr. Pitts has been a warm friend of the State Normal School, and has served for many years as a member and president of the board of trustees. He has taken an active interest in local and national politics, and has been a delegate to many to many county conventions. In 1888 he was a delegate from this congressional district to the National Democratic Convention at St. Louis that re-nominated Grover Cleveland for the presidency. [SRGP 04218] John F. Pitts was born in Richmond township, Tioga county, July 3, 1849 and is the youngest living child of Apollos Pitts. He was reared on a farm and was educated in the common schools of his township. When twenty-one years of age, he purchased one-half of the homestead , and in 1891 bought the other half, making a farm of 300 acres, located a short distance southeast of Mansfield. In December, 1871, Mr. Pitts married Sarah J. Baker, a daughter of Russell Baker, of Charleston Township, and has four children: Mary E., Raymond D., Josephine M. and Arthur H. Mr. Pitts gave his whole attention to farming until his election, in November,1893, to the office of county commissioner. His term expired January 1, 1897, since which time he has devoted himself to his farm. He had previously served as supervisor of Richmond township, in 1889 and 1890. Like his father, Mr. Pitts has been a life-long Democrat, and is a staunch supporter of Democratic principles. He is a member of the I. O. O. F., and the family adhere to the Methodist Episcopal Church. Mr. Pitts is not only one of the leading farmers of this township, but is one of the substantial, enterprising and progressive citizens of his native county. [SRGP 04227] Amos Bixby was born in Windham county, Vermont and was reared in Susquehanna County, Pennsylvania. He was a son of Darius and Rachel (Smith) Bixby, natives of Vermont. In January, 1836, he was married in Earlville, New York, to Lydia G. Sheffield, and in 1844 came to Mansfield, Tioga County. He first engaged in lumber and general merchandising business and in building canal boats at a yard northeast of the borough bridge crossing Tioga river. He later became a conductor and built several sections of the New York and Erie road, being also engaged in track laying on that and the Northern Central. He built and operated the plaster and paint-mill at the south line of what is now Mansfield borough; also a saw-mill on the same site. In connection with mills was a farm on which he resided for ten years preceding his death. Mr. Bixby was a staunch Whig and later a Republican. He was greatly interested in the varying fortunes of the Mansfield Seminary, now the State Normal School, and served many terms as a trustee. He also filled the office of county commissioner for two years, resigning in 1962 on account of ill health. He died August 4, 1862, leaving a wife, one son and two daughters. His wife died in 1881. The children are as follows: Joseph Newell, who died in 1895;Fannie A., widow of Capt. A. M. Pitts, and Harriet M., who died in 1863. [SRGP 86862] Daniel Sherwood, a son of Henry [John] Sherwood, was born in Connecticut, October 23, 1774, and was a descendent of Thomas Sherwood, who came to America in 1634 and settled in New England. While yet a young man the subject of this sketch removed to the vicinity of Marathon, Cortland, county New York, where he was married March 30, 1800, to Anna Stevens, a daughter of John Stevens. She was born May 8, 1783, and became the mother of nine children, all of whom are dead except Hiram M., of Mansfield. In 1830 Mr. Sherwood, In 1830 Mr. Sherwood , several of his sons, and his brother, Noah, came to Tioga county and settled a short distance below the site of Lamb’s Creek, where they built a saw-mill. In 1839 they removed to Mansfield, where Mr. Sherwood continued to reside until his death, April 7, 1859. His wife died February 9, 1848.Before coming to Tioga county, Mr. Sherwood represented Cortland county , New York in the State legislature for several years, and usually made the journey to and from Albany on horseback. He was the founder of the Baptist Church at Mansfield of which his son, Rev. Abijah Sherwood, was the first pastor. He was a man of intelligence, strict integrity and good business ability. His son, Daniel Lee Sherwood, born near Marathon, New York, December 5, 1809, represented Tioga and Potter Counties in the legislature in 1842-43, and Tioga and Bradford in the State Senate from 1844 to 1846, being speaker during the latter year. From 1877 to 1880 he was a representative from Northumberland county. He died at Northumberland, Pennsylvania, October 7, 1886. [SRGP 68392] Albert Sherwood, son of Daniel Sherwood, was born near Marathon, New York, August 27, 1817, and was about thirteen years old when his parents came to Tioga county. In early life he devoted his attention to lumbering, and after the family removed to Mansfield he engaged in farming. On May 28, 1845, he married Julia A. Clark, a daughter of Justus B. and Catherine (Hart) Clark, of Richmond township, to which union were born the following named children: Andrew J., deceased; Daniel Andrew, a resident of Mansfield; Anna M., wife of Daniel L. Fralic, of Corning, New York , and Clark B., who resides in Mansfield. Mr. Sherwood was for many years a Democrat, but later in life acted with the Prohibition party. He was one of the early trustees of the State Normal School at Mansfield, and the longest in service , and some years before his death was made an honorary trustee for life. He was also a member and a deacon of the Baptist Church of Mansfield. He died September 4, 1896, aged seventy-nine years. [SRGP 53142] Daniel Andrew Sherwood was born at Mansfield, Tioga county, July 16, 1848, a son of Albert Sherwood, and grandson of Daniel Sherwood. He obtained his education in the common schools, the State Normal School of his native town, and the University of Chicago. In 1870 he assisted in the Geological Survey of Ohio, under Prof. J. S. Newberry, and was also engaged for five years in field work on the New York Survey , under Prof. James Hall. From 1873 to 1878 he assisted in the Second Geological Survey of Pennsylvania, with Prof. L. P. Lesley, working principally in Tioga , Bradford, Lycoming and Potter Counties. During the World’s Fair in Chicago, he was the manager of the Pennsylvania Mineral Exhibit. He has also been in the employ of the Anchor Oil Company in surveying and locating wells. Mr. Sherwood was married April 17, 1872, to Jennie L. Knapp, a daughter of A. M. and Elizabeth Knapp, of Lawrence Township, and has five children: Anna L., Hugh M., Mattie J., Lola I., and Jennie E. Mr. Sherwood is a member of the Baptist church, a writer of gospel hymns and sacred songs, and takes an interest in religious work. In politics , a Prohibitionist, he was the candidate of that party for the Assembly in 1884, and for the Congress in 1894. He is one of the well-known residence of Mansfield, where nearly his entire life has been passed. [SRGP 51875] Clark Burr Sherwood, youngest child of Albert Sherwood, and grandson of Daniel Sherwood, was born upon the old homestead at Mansfield, Tioga county, February 23, 1852, and was educated in the common schools. After arriving at manhood, he adopted farming as his avocation and has successfully pursued it up to the present time. Mr. Sherwood married Sarah E. Smith, of Lawrence Township, a daughter of Morton and Deborah (Ingersoll)Smith, formerly of Fairfield county, Connecticut. They are the parents of three children named as follows: Julia Floy, by a former marriage; Lorena J., and Daniel Albert. In politics, Mr. Sherwood is a Democrat, with independent tendencies. He is a member of the Patrons of Husbandry, and is one of the prominent and successful farmers of his native township. [SRGP 86436] Dr. Joseph P. Morris, son of Isaac W. and Sarah ( Paschall) Morris, and grandson of Capt. Samuel Morris, a soldier of the Revolution, was born in Philadelphia, Pennsylvania, February 8, 1809. In 1834 he came to Tioga county, and soon afterwards located in Blossburg, there being at that time only a few families in the place. He became a member of the Arbon Coal Company, the first company formed to develop the Blossburg coal and iron deposits , among his associates being James R. Wilson, of Philadelphia ; Dr. Lewis Saynisch, of Blossburg, and James H. Gulick; of New Jersey. He also was interest in and helped to build the Tioga railroad. In 1842 he purchased of James R. Wilson 1,100 acres of land, formerly the Asa Mann property for 12,000. This included nearly all the ground now occupied by the borough of Mansfield. Here he resided until 1846, devoting his time to his land and to the practice of medicine. In the latter year he moved to Wellsboro, resided there up to 1854, and then returned to Mansfield. As the village increased in population his land was laid out in the town lots, and the sale of these and the promotion of enterprises calculated to advance the growth of the town, kept his time fully occupied, although he occasionally answered the call of those needing his medical services. Dr. Morris was one of the original friends and promoters of the Mansfield Classical Seminary and gave six acres of land as a site for that institution. He served as trustee and corresponding secretary of the Seminary for many years, and was one lf its staunchest friends, giving liberally of his means towards its support. He was later a trustee of the State Normal School for some years and also gave the site for the Protestant Episcopal Church at Mansfield. Dr. Morris was married November 2,1836 to Sarah E. Morris, a daughter of Judge Samuel Wells and Anna (Ellis) Morris. Her father was a son of Benjamin Wistar Morris, a pioneer of Wellsboro, and married Anna Ellis, a daughter of William Ellis of Muncy, Lycoming county. To Dr. Joseph P. and Sarah E. Morris were born three children: Alfred, born September 6, 1837, and died June 17, 1860; Catherine, widow of Charles F. Swan, and James Wilson, a civil engineer of Galion, Ohio. In politics, Dr. Morris was a Republican, and an earnest supporter of that party. He died December 17, 1892, at the ripe age of nearly eighty-four years. Though eighty years of age, Mrs. Morris is bright, active and energetic, and gives her personal attention to all matters pertaining to her late husband’s interest. She possesses a fund of interesting information concerning the early history of Mansfield, her memory of dates and events being remarkably clear and accurate. [SRGP 71137] Oliver Elliott, a son of Nathaniel Elliott, was born near Portland, Maine, May 13, 1805. In 1808 his parents came to Tioga county and settled near Covington, removing to Cherry Flats in 1820. Here his father died in 1840,aged seventy-one years, and his mother ,in 1845, aged seventy-nine years. Mr. Elliott married Mary Ann Rockwell, of Troy township, Bradford county, in 1826, who became the mother of eight children: Orson V., a merchant of Mansfield; Oliver W., who died in the Army; Anna B., Deceased wife of Irving S. Harkness; Thomas D., A resident of Mansfield; Victor Alanson , a resident of Denver, and for twelve years circuit court judge of the Supreme Court of Colorado; and Mary and Silas, both deceased. Mrs. Elliot died in 1846, and in 1847 he married her widowed sister, Mrs. Julia Bailey, who died in 1849. In 1850 he married Maria Harkness, a daughter of Joel and Almina Harkness, early settlers of Covington township. Three children were born to this union, only one of whom grew up, Judson A., a resident of Mansfield. From 1836 to 1849 Mr. Elliott resided on his farm near Mansfield, but in the spring of 1850 he returned to Cherry Flats, where he carried on a general store until 1868. From 1868 to 1872 he was a partner with his eldest son, Orson V., in the shoe business at Mansfield. In 1872 he sold his interest to his son and removed to Charleston township, and engaged in farming. A year later he returned to Mansfield, and in 1876, with his youngest son, Judson A., purchased the mercantile business of William Adams, and established the firm of O. Elliott & Son, in which he continued until his death, April 24, 1891. [SRGP 71138] Thomas D. Elliott, a retired farmer of Mansfield was born in that borough in 1834, and is the fourth child of Oliver and Mary Ann (Rockwell) Elliott. He followed farming for some years, and later conducted a meat market in Wellsboro, whence he removed to a farm in Charleston township, and subsequently to Mansfield. He married Julia A. Macumber, of Richmond township, and reared three children: Nettie , wife of S. C. Peake of Troy, Bradford County; Walter V., a dentist in Waverly, New York, and George H. deceased. Mr. Elliott and his wife are members of the One Hundred and Forty-ninth Pennsylvania Volunteers. [SRGP 73245] George H. Elliott, youngest child of Thomas D. Elliott, and grandson of Oliver Elliott, was born in Richmond township, Tioga county, July $, 1863.He was reared on the Homestead farm, and obtained his education in the district schools and at Wellsboro High School. When twenty-two years of age he began running a huckster wagon in Charleston township, which business he continued five years, at which time he purchased a farm of 112 acres in Delmar township, on which he resided until his death, January 26,1897. Mr. Elliott was married October 14, 1885, to Louise H. Coolidge, a daughter of D.K. and Mary A. (Meacham) Coolidge, and left one child. He was a member of the Baptist church, to which his widow also belongs. In politics he was an adherent of the Republican party. [SRGP 86771] Larman H. Elliott was born in Ancrum, New York, June 4, 1794, a son of William Elliott. He acquired a fair English education in his youth and later learned the mason’s trade. In 1804 he came to Pennsylvania and settled in Wysox, Bradford county, where he witnessed the great eclipse of 1806. He afterwards went to Sheshequin, in the same county, where, September 9,1821, he married Mary Wright. She was born in Lisle, Broome county, New York, December 23, 1804. In 1841 they came to Tioga county and located in Middlebury township, where he followed farming, school teaching and working at his trade. In 1848 they removed to Mansfield which remained their place of residence until their death. Mr. Elliott died April 12, 1872, and his wife, December 28, 1888. They were the parents of two sons, Charles Volney and Simon Bolivar. [SRGP 82641] Charles Volney Elliott, M.D., son of Larman H. and Mary Elliott, was born in Sheshequin, Bradford county, Pennsylvania, March 27, 1824, and was seventeen when years old when his father removed to this county. He read medicine with Dr. Nelson Packer of Wellsboro, and afterwards took a course of study at Geneva Medical College, Geneva, New York. In 1847 he began the practice of his profession in Mansfield. In the autumn of 1856 he removed to Hudson City, Wisconsin, but in 1859 returned to Mansfield, resumed his practice here, and also opened a drug store, which he carried on up to 1891, when he sold out to J. M. Smith. In 1860 he was appointed postmaster of Mansfield, and held the office for twelve years. In 1876 he was elected to the legislature, and was re-elected in 1878. He has also served as burgess of Mansfield, a member of the borough council, and as trustee of the State Normal School. Dr. Elliott was married in August, 1847, to Eliza Graves, of Troy, Bradford county. Their only child Mary E., is now the wife of Dr. C. W. Brown of Washington, D.C. Mrs. Elliott died November 2, 1862, and Dr. Elliott married his second wife, Julia Alice Holden, a daughter of D. L. and Elizabeth (Mudge) Holden, of Mansfield. The only child of this marriage, Arthur H., was born September 4, 1867; as a graduate of the College of Pharmacy, Philadelphia; married E. Mattie Doane, and is now a druggist in Wellsboro. In politics, Dr. Elliott is a Republican, and in religion an adherent of the Protestant Episcopal church. He is also a member of the Friendship Lodge, No. 247, F. & A. M. Dr. Elliott retired from business and the practice of his profession in 1891, since which time he has devoted his attention to the cultivation of his pleasantly situated homestead in the northern suburbs of Mansfield. During the many years he was engaged in the practice of medicine, he not only earned an enduring reputation as a skillful and successful physician, but has long been regarded as one of the foremost citizen of the county. His services in the legislature and in various other offices he has filled, were characterized by an unfaltering fidelity to duty and an unwavering adherence to principle. True to every trust reposed in him, he enjoys the respect and esteem of the community in which the portion of his life has been spent. [SRGP 84113] William M. Barden, M.D., was born in Benton, New York, February 14, 1812, and was educated at Geneva Medical College. He married Olive Hanley, a native of Hector, Schuyler county, New York, to which union were born four children: O. P.., recently deceased, who for many years was a practicing physician in Tioga borough; Samuel O., a resident of Richmond township; Olive Louise, who died in infancy, and John M., a physician of Roseville, Tioga county . Mrs. Barden died in 1847, in Benton, New York, and in 1852 Dr. Barden came to Mansfield, Tioga county. He was the first homeopathic physician in the borough, and notwithstanding the prejudice in favor of the old school, he soon established a reputation as a skillful and successful practitioner. He died September 30, 1884. [SRGP 18264] John M. Barden, M.D., son of Dr. William M. Barden, was born in Benton, Yates county, New York, January 23, 1834. He was educated in the common schools and at Peach Orchard Academy, Hector, New York, studied medicine under his father, and was admitted to practice in 1862. He located at Roseville, Tioga county, where he continued his professional duties until 1881, when he removed to Mansfield. Here he practiced his profession until April, 1895, when he returned to Roseville, where he now resides. Dr. Barden was married to Harriet H. Ketchum, a daughter of Joseph and Phoebe Ketchum, January 5, 1860. Her parents came from Lisle, Broome county, New York, to Mansfield in 1858. Four children have blessed this union as follows; Kate, wife of A.W. Stevenson, of Mansfield; Estelle, wife of J. C. Gallop, of Smethport, McKean county; John L., who lives with his parents, and Otis, who died in infancy. Dr. Barden is a staunch Republican, and while a resident of Mansfield filled the office of burgess, served in the borough council, and was a president of the board of trade, and the Smythe Park Association. He is a member of the Baptist church, also of Friendship Lodge, No. 247, F. & A. M., and Mansfield Lodge, No. 526, I.O.O.F. He is connected with the Southern Tier Homeopathic Association, of New York, and is one of the well-known practitioners of his school of medicine. To a successful career as a physician, Dr. Barden has added that of a citizen ever ready to forward the best interest of the community in which he lives. [SRGP 87204] Andrew J. Ross was born in Pike township, Bradford county, Pennsylvania, February 23, 1827. His father , Isaac Ross, was an early settler of Bradford county, and also a contractor on the North Branch canal, where Andrew J. was employed as a foreman. He afterwards clerked in a store at Stanton, Pennsylvania, and in 1854 located in Wellsboro, Tioga county. A year later he removed to Mansfield , and in partnership with the late Philip Williams, under the firm name of Ross & Williams, engaged in merchandising. In 1860 the firm added lumbering to their business and in 1865 sold out the store, but continued their lumber operations, and also opened a loan office. On May 24, 1872, they established the banking house of Ross & Williams, of which Mr. Ross continued as senior partner until his death, August 18, 1875. On April 22, 1856, he married Sarah McKune, a daughter of James McKune, to which union were born two children, Charles S. and Edward H. Mrs. Ross died on July 9, 1882, aged fifty-two years. During the thirty years of his residence in Mansfield , Mr. Ross was prominent both as a business man and a citizen . He took a deep interest in the building up of the borough, and gave a cordial and earnest support to every enterprise having that end in view. He was a warm friend of the Mansfield Classical Seminary and its successor, The State Normal School, during the years it was beset with difficulties and vicissitudes and served on the board of trustees and as treasurer of the institution for a number of years. In politics he was a Republican , and in religion , a member of the Protestant Episcopal church. [SRGP 87205] Charles S. Ross, eldest son of Andrew J. Ross, was born in Mansfield, Tioga county, February 14, 1857. He was educated in the State Normal School, from which he graduated in 1876. Immediately afterwards he entered the banking house of Ross & Williams, as a representative of his father’s interest, and in the summer of 1878 he succeeded to the place in that firm made vacant by his father’s death. After the death of Mr. Williams in July, 1894, Mr. Ross carried on the business as surviving partner, until January 1,1895, when he became the sole proprietor, but continued under the old firm name. In politics, Mr. Ross is a Republican, but has never sought or held office. [SRGP 87208] Edward H. Ross, youngest son of Andrew J. Ross, was born in Mansfield, Tioga county, November 10, 1863. He was educated at the State Normal School, Mansfield, and the military academy at White Plains, New York, from which institution he graduated in 1883. He studied law in the office of Elliott & Watrous, of Wellsboro, but has never practiced. In 1889 he established the Ross Cigar Company, which employs about fifty hands in the manufacture of cigars for the retail trade. Under his management the enterprise has proven successful and is an important factor in the industrial life of Mansfield. Mr. Ross was married April 5, 1893, to Miss Mary Waldo, and has one son, Charles Waldo. In politics, he is a Republican, and is connected with Friendship Lodge, No. 247, F. & A.M.
[SRGP 51641] Lawton Cummings was born in Oswego, New York, June 7, 1826, and was one of nine children born to Lawton C. and Polly ( McMillan) Cummings, as follows: Maria, wife of James C. Skinner, of Evanston, Illinois; David , deceased; Lawton, of Mansfield; Frances, wife of L H. Robbins, of Mansfield; Edwin, deceased; Eunice, wife of Horace Case, of Coldwater, Michigan; Elliott , a resident of California; Lucy, and John, the last deceased. When the subject of this sketch was three years old his parents removed to Oneida county, New York. There he grew to manhood, attending school until his was fourteen years old, and later learning the carpenter’s trade. His mother died in 1840, and his father subsequently married Lurana Hoard, removing to Coldwater Michigan, and there passed the remaining years of his life. In 1850 Mr. Cummings came to Mansfield, Tioga county where he worked at his trade for a few years. In 1852 he embarked in merchandising, as a member of the firm of Hoard, Beach & Cummings, in which he continued several years. He was among the earliest subscribers to the Mansfield Classical Seminary fund and was employed as a foreman in the erection of the first building. He was actively engaged as a carpenter and builder up to 1887, when he and his son, John L, opened a bakery and confectionery, under the firm name of J. L. Cummings & Company, which has proven a prosperous venture. On December 12, 1852, Mr. Cummings married Polly Hunt, a daughter of Samuel Hunt, of Mansfield, to which union have been born three children: Nettie S., John L., and Ida Belle. In politics, he is a Democrat, and in religion , a member of the Methodist Episcopal church. [SRGP 80760] John L. Cummings, son of Lawton Cummings, was born in Mansfield, Tioga county, August 2, 1862, and was educated in the State Normal School and the Allen Business College. In 1887 he formed a partnership with his father, under the firm name of J. L. Cummings & Company, and established their present bakery and confectionery business, On August 16, 1894, he was appointed postmaster of Mansfield , by President Cleveland, and still hold the office. In politics, Mr. Cummings is a staunch Democrat, has served as a delegate to county conventions, and is recognized as one of the local leaders in his party. In religion, he is member of the Methodist Episcopal church. [SRGP 16672] Roswell Bailey was born in Vermont, December 25, 1782, came to Tioga county, Pennsylvania, about the year1802, and located in Tioga township. In 1810 he removed to Dartt settlement, in Charleston township, where he cleared and improved a farm and died October 24, 1840. In 1805 Mr. Bailey married Lucinda Clark, of which union six children grew to maturity named as follows: Clark W., Robert B., Roswell W., Mary A., Benjamin M., And Justus B. Mrs. Bailey died in the early twenties, and in 1823 he married Julia A. Rockwell, who became the mother of six children: John W., Rockwell S., George W., Julia A., Ellen M., and Caroline. [SRGP 20938] Clark W. Bailey was born in Tioga Township, Tioga county, January 12, 1806, and was the eldest son of Roswell and Lucinda Bailey. He grew up amidst pioneer surroundings, and attended school in the old-fashioned log school house of early days. When twenty-one years of age he purchased a farm near Whitney’s Corners, near Charleston township, and later formed a partnership with R. G. White, erected a large steam saw-mill, and engaged in the lumber business on an extensive scale. In 1857 he removed to Mansfield, where he purchased a grist-mill, and the following year built a water -powered saw-mill, both of which he operated until 1866, when he sold out to his sons, Thomas H. and Justus W. He also owned and operated a foundry in Mansfield, and was one of its most prominent business men for many years. He was instrumental in establishing the Mansfield Seminary, was a liberal supporter of all public enterprises, and an earnest member of the Methodist Episcopal church. On May 13, 1827, Mr. Bailey married Vesta Judd, of Binghamton, New York, to which union were born ten children, as follows: Sarah L, Roswell G., Julius M., Wesley V., Thomas H., Emily J., Julia A., Justus W., Clarissa V. and Clark B. Mr. Bailey died at the home of his son, Julius M., December 22, 1881. His widow survives until October 2, 1882, dying at the age of seventy-four years. [SRGP 31036] Thomas H. Bailey was born in Tioga township, Tioga county, December 1, 1839, and is the fourth son of Clark W. Bailey. He was reared on the homestead farm, obtained a common school education, and after attaining manhood he purchased a grist-mill from his father, which he operated until 1889. In 1866 he and his brother, Justus W. bought their father’s saw-mill and a few years later they also bought the foundry at Mansfield. A short time afterwards, Thomas H. purchased his brother’s interest in both industries, but the mills were swept away by the flood of June 1889, entailing upon Mr. Bailey a heavy loss. He purchased several large tracts of timber lands at different periods, some of which he still retains. Mr. Bailey was married September 30, 1868 to Josephine Hillier, a daughter of John Hillier, of Larry’s Creek, Lycoming county, and has two children, Sarah V., and Henry W. The family are members of the Methodist Episcopal church, and Mr. Bailey is connected with the F.&A.M. and the I.O.O.F. societies. In politics he has been a life-long Republican and one of the local leaders in his party. He was burgess of Mansfield for several years; a member of the council for nine years, and a member of the school board for six years. For eighteen years he was one of the trustees of the State Normal School at Mansfield, in which institution he has always taken a deep interest. In the autumn of 1896 he was elected a county commissioner , and moved his family to Wellsboro the following spring. He was re-elected in the fall of 1893, and served until the close of 1896.He then purchased the Allen Hotel in Mansfield and took charge of that house in April, 1897, of which he is now proprietor. [SRGP 16949] Robert B. Bailey, second son of Roswell and Lucinda (Clark) Bailey, was born January 28, in 1808, in Tioga county. He was reared to manhood in Charleston township. After his marriage he purchased a farm of 300 acres in Richmond township, where he passed the remaining years of his life, and died October 17, 1884. Mr. Bailey was married three times. His first wife, to whom he was married February 20,1834 was Lucy Holden, a daughter of Daniel Holden, an early settler in Mansfield. To this union were born the following children: Lydia, wife of George Hollands, of Homerville, New York; Justus M. Deceased; Mary Augusta, wife of George Baker, of Rutland; Charlotte Lucy and Roswell Burr, of Mansfield; Dallas N., deceased; Eliza May, wife of Alexander Gaylord, of Blossburg. Mrs. Bailey was born December 31,1812, and died July 13, 1847. Mr. Bailey’s second wife was Sophia Lewis. By this marriage there was no issue. For his third wife he married Julia Hagar, born May 2, 1830, a daughter of Isaac and Sallie Hagar, of Sullivan township. She bore him seven children; Myron F., of Wellsboro; Robert Wilson, deceased; Elton L., of Mansfield; Wallace J., of Wellsboro; Carl E., of Elkland; Frank W., of Wellsboro; and Fred D., of Mansfield. After Mr. Bailey’s Death his widow removed to Mansfield, where she still resides. He was a Republican in politics, and had served as collector of Richmond township. [SRGP 09661] John C. Howe was born in Stafford, Connecticut, January 15, 1817, a son of John and Mary ( Davison) Howe. On his mother’s side, he is descended from the Cotton family, whose ancestors, Sir John Cotton, landed at Plymouth, Massachusetts, in 1623. His grandfathers, James Howe and Daniel Davison, served in the Revolution, the latter under Gen. Israel Putnam, and his great-grandfather, Daniel Davison, Sr., was in the French and Indian War. Three uncles, Col. Zephaniah Williams, Corp. Silas Howe, and Joel Davison, served in the War of 1812; while his brother, Frederick Howe , and three nephews, Samuel Burdick ( who died at Andersonville), Dwight and Wesley Keigwin, the last of whom was a prisoner in Libby, all served during the Rebellion. The subject of this sketch lived in Connecticut until twenty-one years of age, and then came to Greenfield township, Lackawanna county, whence he removed to Mansfield in April 1859. On January 29, 1843, he married Lodemia Smith, a native of Greenville, New York, born June 22, 1822. She became the mother of six children: Martha, wife of Harry B. Shaw, of Mansfield; Elvira , deceased wife of William Gerald; John Frank and Hezekiah W., of Mansfield; Emma, a resident of Lincoln, Nebraska. and Eunice, wife of J. M. D. Powers, of Richmond township, Mrs. Howe died March 15, 1873, and April 15, 1874, he married Elizabeth Van Deusen. She was born at Palatine Bridge, New York, April 22, 1839, and is the mother of one son, Van V., a graduate of the State Normal School. On November 15, 1861, Mr. Howe enlisted in Company B, One Hundred and First Pennsylvania Volunteers. He received a gunshot wound in the right hand at the battle of Fair Oaks. He also served in the battles of Yorktown, Williamsburg, Kingston, White Hall and Goldsboro, and was honorably discharged on April 1, 1863.Mr. Howe assisted in establishing the Mansfield Classical Seminary, and was a member of the board of trustees for thirty -four years. He was a member of the building committee, and advanced a large sum of money to aid in the construction of the buildings, which liberal act came near wrecking him financially. Originally a Whig, he has been a Republican since the organization of that party. He has served as a school director and one term as justice of the peace of Richmond township. He is connected with Mansfield Post, No.48, G.A.R., and is a member of the Presbyterian church. Mrs. Howe’s great- grandfather . Gensman, served in the French and Indian War, while her grandfather, Proudy Van Deusen, served under General Putnam in the Revolution. Her father had two brothers in the War of 1812, and three of her brothers served in the Rebellion. She is a charter member of and an active worker in Mansfield Post, No. 6, W.R.C. Her brother, Dr. George H. Van Deusen. was a surgeon in the United States Navy, and witnessed the memorable conflict between the Monitor and Merrimac, while on board the man-of-war Sachem and her brother Gerrett, was a surgeon’s steward in the fleet. [SRGP 31424] Rev. William DeWitt Taylor was born in Yates county, New York, September 24, 1831, and was educated in Franklin Academy, Prattsburg, New York, from which institution he graduated in the classical course in 1859. He taught school successfully for several years and graduated at Union College, Schenectady, New York. He entered the ministry of the Methodist Episcopal Church, as a member of the Genesee Conference. In 1863 and 1864 he was a principal of the Mansfield Classical Seminary. After the school passed under the control of the State, he resigned and resumed his ministerial work, continuing in the active duties thereof until 1886, filling in the meantime a number of important appointments. For a few years after retiring from the ministry, he was engaged in the insurance business in Binghamton, New York. In 1888, he purchased a farm of 190 acres near Canoe Camp, Tioga county, Pennsylvania, where he resided until his death, January 16, 1892. Mr. Taylor was twice married. His first wife, Hattie Hayes, was a daughter of Dr. Hayes of Prattsburg, New York, and bore him one son, who died in 1888, at the age of twenty-five years. Mrs. Taylor died in Binghamton, New York. On January 3, 1888, he married Mrs. Amy (Davis) Cottrell, a daughter of Capt. Ezra and Betsey (Walker) Davis. She was born in Mansfield, Tioga county and at the time of her marriage to Mr. Taylor was a widow of Charles S. Cottrell of McComb, Illinois, whom she married on September 17, 1873. Mr. Cottrell died December 4, 1876. He was a prominent business man of McComb, a director in the McComb bank and a leading and influential citizen. He left two children Charles S. and Clara D. Mrs. Taylor was married to Joseph Schusler of Mansfield, March 4, 1897. [SRGP 21935] Charles Sullings Kingsley was born in Pittsford, Vermont, June 13, 1844, a son of Ralph R. and Sarah (Sullings) Kingsley, both natives of Vermont and descendents of prominent New England families. His father was born June 9, 1810 and his mother in 1815. In 1847 the family came to Troy, Bradford county Pennsylvania, where Mr. Kingsley engaged in the tannery business as a member of the firm o f Bowen & Kingsley, with which he was connected ten years. In 1865 he came to Mansfield, Tioga county, where purchased an interest in the John W. Kohn tannery. Three years later he bought out his partner, and was connected with the business up to his death, December 26, 1893. His widow is yet living, at the ripe age of eighty-one years. They were the parents of three children: Francis E., Charles S., and Flora, all residents of Mansfield. The subject of this sketch was educated in the common schools and at the Collegiate Institute, in Towanda, Pennsylvania. February 25, 1864, he enlisted in the Third Pennsylvania Artillery and was hororably discharged from the service at Philadelphia, November 9, 1865.Most of the time he was stationed at Fortress Monroe, and the last nine months of his term he was a clerk in the adjutant’s office. Returning to Mansfield he engaged in the tannery business with his father, the firm being R.R. Kingsley & Son until the fall of 1868, when it was changed to C. S. Kingsley, its present title. September 12. 1872. Mr. Kingsley married Jennie Linn Bailey, a daughter of Benjamin and Clarissa (Johnson ) Bailey, and has three children, viz: Harry B., Ralph R. and Kate S. In politics, Mr. Kingsley is a Republican, and has filled offices of burgess, councilman, school director and treasurer of the school board. He is a member of General Mansfield Post ,No. 48, G.A.R., and is one of the well-known, enterprising citizens of Mansfield. [SRGP 73131] Levi Elliott was a native of Penobscot, Maine, born in 1791. He was a son of Nathaniel and Nancy (Armstrong) Elliott, who came to Tioga county, Pennsylvania, in 1808. They located near Covington, and later removed to Cherry Flats, where they passed the remainder of their lives. In 1812 the subject of this sketch married Amy Gillett, also born in 1791, a daughter of Aaron Gillett, who came from Connecticut to Tioga county, in 1798, and settled at Canoe Camp, removing in 1812 to Cherry Flats. Mr. Elliott was a farmer and lived in Covington until 1822, when they moved into Charleston township, where he resided until his death, December 5, 1866, aged seventy- five years; his wife died in 1883, aged ninety-two years. They were the parents of seven children, of whom but two are living, viz: Horace J., and Nathaniel A., the former a resident of Westfield, and the latter of Mansfield, Tioga county. [SRGP 71136] Nathaniel A. Elliott was born in Covington township, Tioga county, February 18, 1817, a son of Levi Elliott. He was reared on a farm, and received such an education as the pioneer county schools afforded. On attaining his majority, he purchased a farm of fifty acres at Cherry Flats, to which he added from time to time until he owned 400 acres. In 1866 he located in Mansfield, which has since been his place of residence. Mr. Elliott was married September 10, 1838, to Anna Myra Hart, a daughter of Ludwig Hart. 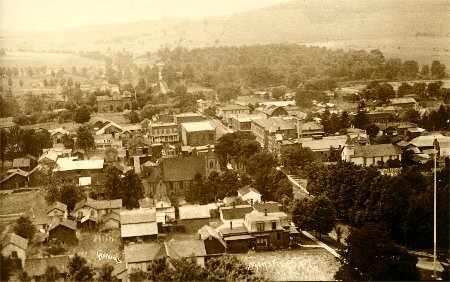 The only child of this union, Mortimer F., a prominent lawyer, is now the attorney of the Standard Oil Company at Oil City, though Wellsboro is his place of residence. Mrs. Elliott died April 3, 1843, and October 10, 1844, he married Charlotte E. Harkness, a daughter of Joel and Elmina Harkness. Five children were born to this marriage, viz: Francis and Edward A. both deceased George Frederick, a physician of Mansfield; Fannie E., wife of T.O. Whitnall, of Syracuse, New York, and Henry A. deceased. In politics, Mr. Elliott ia an unwavering Democrat, and for many years has been prominent in the local councils of his party. He served in the state legislature in 1848-49; was county commissioner from 1876 to 1882, and has also filled the office of justice of the peace, assessor of the borough and school director. President Cleveland appointed him postmaster of Mansfield in 1886, and he held the office until 1890. In religion, he is a member of the Presbyterian church, and is also connected with Friendship Lodge, No. 247, F.& A.M. Colonel Elliott is one of the oldest living citizens born in Tioga county, as well as one of the best informed concerning its history. His long life has been earnest, useful and unblemished, and the respect and esteem which he enjoys is a well-deserved tribute to his character. [SRGP 21393] James Hoard, son of Enos Hoard, was born March 17, 1810, in Stockbridge, New York, there grew to maturity, and January 1,1840, married Almira Robbins, who was born in Stockbridge, Massachusetts, November 1, 1809. In the fall of 1849 the family came to Richmond township, Tioga county, and settled five miles west of Mansfield, where Mr. Hoard was engaged in farming until 1874. In that year he removed to Mansfield, and died on May 2, 1878. His wife died July 20, 1890. They were the parents of the following children: Fannie Gertrude, wife of Wesley Bailey, of Richmond township; Sarah J., and James Perry, both deceased, and Joseph Seth, of Mansfield. In politics Mr. Hoard was a Republican, and in religion , a member of the Presbyterian church. He was an earnest, sincere man whose upright life won him the respect of all who knew him. [SRGP 51887] Joseph Seth Hoard was born in Richmond township, Tioga county, November 7, 1852, and is the youngest child of James and Almira Hoard. He was reared on a farm, attended the common schools of his district in boyhood, and graduated from the State Normal School, at Mansfield in 1871. After his graduation he taught one year, and then took a course in Eastman’s Business College, Poughkeepsie, New York. On November 1, 1872, he entered the banking house of Ross and Williams, of Mansfield, as a bookkeeper, and remained in that institution up to 1885, during which period he also had charge of the insurance business carried on in connection with the bank. Upon leaving the bank he established the well-known insurance agency with which his name has since been connected. Mr. Hoard was married June 10, 1875, to Sarah Margaret Elliott, a daughter of Orson V., and Celia (Kelly) Elliott, of Mansfield, who has borne him three children, viz: Harry Reed., Nellie Margaret and Donald Victor. In religion, Mr. Hoard is a member of the Presbyterian church, and in politics, an adherent of the Republican party. He is a trustee of the State Normal School, and has been secretary and assistant secretary of Smythe Park Association for several years. He takes a deep interest in the cause of education as well as in everything that assists in the moral advancement of the community.